Home Forums Bolt action rifles 9.3×57 cast boolits? todd 5 months, 1 week ago. next year, i’m planning to go with a husky 46 in 9.3x57mm. the brass and reloading dies, i can find. i’m having a rough time trying to find a cast boolit load. it will be 270-285gr boolit and it should go 1700-1900fps. does anyone have a book i could buy or a load that i can use? Hello, hope I’m not too late to help with the old Husky. Doc44 and I bought a couple, a 46 and 46A. The bores on them are way oversized, so be sure to slug it. Also there is over .5″ of freebore, which is about .370″, so use a fat boolit. Somebody sent me some of the NOE 280s to try. I lubed them with 2500+ and seated to 2.963″ in a neck sized case. 24 grains of 2400 gave 1540fps and a great group. We tried some jacketed bullets in them also. Most of what we shot was the Sierra 200gn .375 and Speer 235gn .375. I got an NOE push through sizer with a few dies. I polished the die insert really well, then lubed the bullets with Imperial Sizing Die Wax and they popped right through. Use lots of lube and a quick stroke on a heavy press. The bullets will spring back .001″. H4895 seemed to be the best powder for the jacketed bullets. My 46 is arriving tomorrow…..looking forward to getting it fired up! Here is a site with piles of load info and information. Glenn, Thanks for the info! My dies and PPU brass arrived today. The norma brass price was more than I wanted to go before have a good look at this old girl. There was also a post on “the other” place from Skeettx. I have PM’d him with questions as well. I am headed to pick it up tomorrow! More to come…. I tried some of the Speer 9.3 270s seated to 3.050″ with 51gns of CFE223. In PPU 8×57 brass gave 2022fps and a pretty nice group. That’s such an awesome caliber. Looks like a good time!!! I used the 235 Speers, sized down to .368″, last year loaded to 2500ish and got complete penetration stem to stern on a Doe. The rifle is very light and just feels wonderful in your hands. Glenn, thanks for the CFE target! I’m going to give that a shot!!! UPDATE! THIS new to me Husqvarna 46 is freaking awesome! I am in love! So I got some new 8X57 PPU cases, following skeettx’s advice, simply lubed them with the Imperial Sizing Wax inside the neck and outside of the cases, and ran them through the 9.3X57 Hornady full length sizing die. That works flawlessly, and I didn’t need to trim the cases at all! Just chamfered them and primed them up. There was a lot of talk on the gunboards post mentioned above about fire forming the cases after sizing due to some rifles having excessive headspace, primers backing out, etc. So I looked on LoadData and found a load listed for IMR4895 as a good hunting round, of 46 Grains. I backed that down to 42 grains, loaded up all 50 cases with 270 Grain Speer Hotcors! At my friends range today, we fired all 50 cases with what I would call excellent results. First of the all the primers only backed out between .011 to .013 which I would call immaterial. This rifle only has the original iron sites and we had ~2.5 to 3 inch group at 50 yards with ~15 rounds fired from the bench. With this load it shoots about 3 inches high and 3″ right, but that is very consistent. 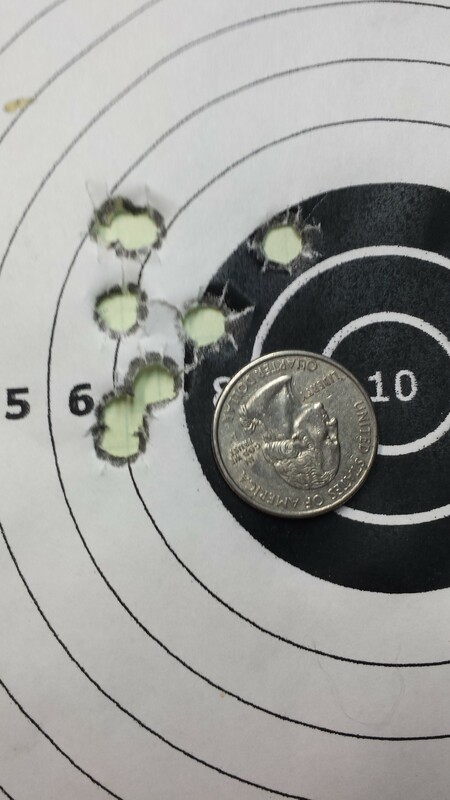 We have a 12″ steel gong at 100 yards and I finished shooting the rounds hitting the gong 5 out 6 shots. For a guy who can’t shoot iron sights worth a crap most of the time, I was happy with that! With these light forming loads, recoil was next to nothing. I wouldn’t hesitate have my 12 year shoot this rifle with that load. Going to wet tumbled the cases, neck size only, and reload with some loads close to the loads on Glenn’s target picture above with CFE223 and see where we are after that before attempting to move the sites at all. The real question becomes……how long will I keep shooting this before I send it off to have it drilled for a scope???? Brodie Brickey, i’ll have to check them out. i was a subscriber years ago. ZmanWakeForest, they’re good guns!!!!! https://goodsteelforum.com/forums/topic/husky-9-3×57/ and https://forums.gunboards.com/showthread.php?1017546-i-got-it!! !